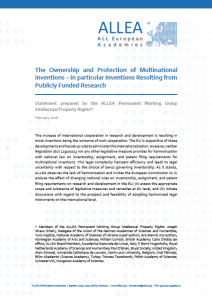 The ALLEA Permanent Working Group Intellectual Property Rights (PWGIPR) released a statement today titled “The Ownership and Protection of Multinational Inventions – in Particular Inventions Resulting from Publicly Funded Research”. The increasing internationalisation of research and development has led to more inventions as the outcome of such cooperation. The EU is supportive of these developments and has set up rules to administer this internationalisation. However, neither Regulation (EU) 1290/2013 nor any other legislative measure provides for harmonisation with national law on inventorship, assignment, and patent filing requirements for multinational inventions. The ALLEA Permanent Working Group Intellectual Property Rights warns that this legal complexity hampers efficiency in the research and development area and leads to legal uncertainty with respect to the choice of law(s) governing inventorship. In their statement, the ALLEA experts observe the lack of harmonisation and invite the European Commission to (i) analyse the effect of diverging national rules on inventorship, assignment, and patent filing requirements on research and development in the EU, (ii) assess the appropriate scope and substance of legislative measures and remedies at EU level, and (iii) initiate discussions with regard to the prospect and feasibility of adopting harmonised legal instruments on the international level. The ALLEA Permanent Working Group Intellectual Property Rights combines decades of highly specialised expertise in the European legal framework for patents and copyrights. Among other topics, the expert group focuses on the legal challenges of Intellectual Property Rights and the EU Framework Programme for Research and Innovation. Previous related statements include inter alia “On the Status of the Patent System of the European Union” published in 2015. ALLEA General Assembly 2018: Registration is Now Open!